VIPAccessEXCLUSIVE: Max And Harvey Interview With Alexisjoyvipaccess At The 2019 Nickelodeon Kids’ Choice Awards! It’s clear to see that dynamic duo Max and Harvey are taking over the entertainment world by storm and they are making an everlasting mark while doing so. These awesome, twin brothers have always had a passion for music and they started singing and playing instruments at a very young age. The world instantly fell head over heels for Max and Harvey after spotting them on the hit app, Musical.ly, now known as TikTok. Max and Harvey captured the hearts of fans by sharing fun content on the app, and the rest is history. Since then, Max and Harvey have had a countless amount of awe-inspiring and brilliant achievements. They have released exceptional music that fans have been listening to on constant repeat. Their catchy songs including “Trade Hearts” and “Stuck on the Ceiling” is loved by everyone and they even just recently released their terrific, debut EP, “Coming Soon,” which everyone has been jamming out to. Max and Harvey also released their very own book titled, Max and Harvey: In A Book alongside a BBC show, My Life: Max and Harvey. Oh, and that’s not all! BBC’s children’s television channel, CBBC even gave Max and Harvey their own show called “FOMO.” Needless to say, there are tons of ways to get your Max and Harvey fix – whether it is by listening to their music, reading their book or watching them on TV. Max and Harvey have also been nominated for many prestigious awards including at this year’s Nickelodeon Kids’ Choice Awards and more. Now, the guys are heading out on tour next month which is bound to be another great success. We’re so thrilled for Max and Harvey’s many accomplishments and we know that they will continue to leave everyone amazed with their spectacular talents! I, Alexisjoyvipaccess had the honor of covering the 2019 Nickelodeon Kids’ Choice Awards and had a fantastic time interviewing the remarkable Max and Harvey at the event. Max and Harvey dished exclusively to Alexisjoyvipaccess all about what their favorite song is off of their “Coming Soon” EP, what it was like for them getting slimed and so much more only in our VIPAccessEXCLUSIVE interview. Max and Harvey even spilled on what their reaction was like when they found out they were nominated for a Kids’ Choice Award – hear what they had to say in our VIPAccessEXCLUSIVE interview below. Thanks for the fun interview, Max and Harvey! 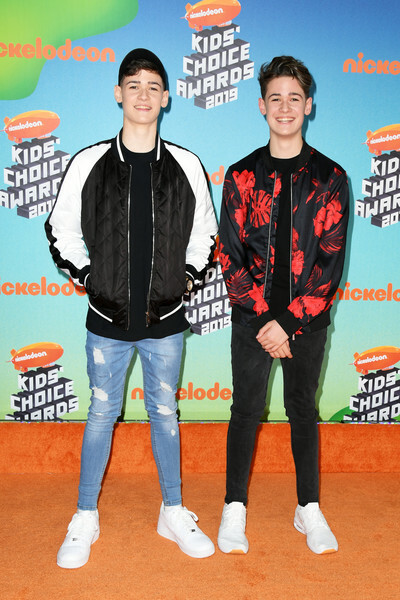 Check out my VIPAccessEXCLUSIVE interview with the outstanding Max and Harvey at the 2019 Nickelodeon Kids’ Choice Awards below! Previous VIPAccessEXCLUSIVE: Find Out Where Noah Centineo, Lana Condor, JoJo Siwa And More Are Sitting At The 2019 Nickelodeon Kids’ Choice Awards Seating Card Tour With Dallas Dupree Young And Scarlet Spencer! Next VIPAccessEXCLUSIVE: In Real Life Interview With Alexisjoyvipaccess At The 2019 Nickelodeon Kids’ Choice Awards!